Some patients of a Paterson, New Jersey, health facility tell NBC 4 New York’s I-Team they feel misled by a chiropractor they had assumed was a medical doctor who promised to reverse or cure diabetes -- a medical condition that chiropractors in the Garden State are not licensed to treat. 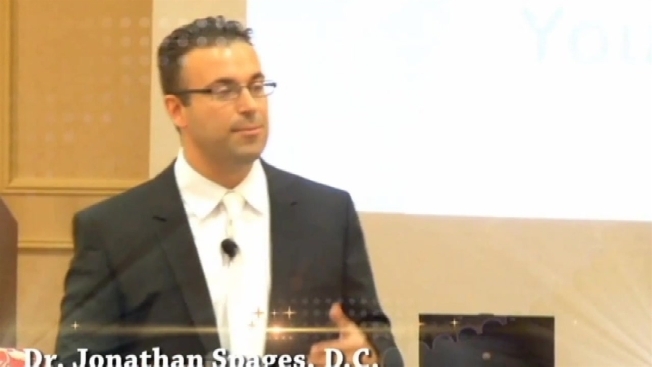 The chiropractor, Jonathan Spages, established Integrated Health Center of New Jersey and often holds seminars in Saddlebrook at the Marriot Hotel, where he treats potential clients to a meal so they can hear his pitch about curing the metabolic disease that affects nearly 30 million people. An I-Team producer attended one of Spages' seminars and could not recall him say at any point during the 90-minute discussion that he was a chiropractor. The producer heard Spages speak very technically about medicine and say he could reverse diabetes by fixing broken metabolisms. Spages said at the seminar that not everyone could be cured, but he said he did not accept patients he did not believe he could help. Lety Reyes, who has suffered from diabetes for years, heard Spages speak at one of his seminars and signed up for his help immediately. “He made you feel like, 'My God, he’s going to do a miracle on me,'" Reyes said. Arvind Patel also became a patient after attending a seminar where Spages promised to “reverse” diabetes. Patel says he put his trust in the doctor. Asked if Spages reversed his condition, Patel said, "No, not really." Patel also said he felt funny about taking dozens of vitamins, and an assortment of creams to apply to his knee, toes and ankles as part of his treatment under Spages' care. While Patel says each visit with Spages lasted no more than 15 minutes, he received a medical bill for $8,000, and later learned the visits had each cost him more than $500. “He never checked blood sugar, even," Patel said. "I said, 'BMI. Check my BMI.' He says, 'We’re not a sports club.'" Reyes received a bill for more than $1,000, and she says Spages never even treated her. She said she canceled the treatment before it began but was told she was still on the hook for a bill for lab work, even though she never had the lab work completed. The I-Team called Spages several times and reached out to him via email. He declined to do an on-camera interview unless questions were provided in advance, which the I-Team does not typically do. The I-Team caught up with Spages after one of his Marriott seminars, and he declined to comment. In a statement e-mailed to the I-Team, Spages said diabetic patients must be under the care of a medical doctor. He declined to comment on individual patient cases like those of Reyes and Patel. In a video posted online, the doctor did sit down to speak with host Graison Stemper on a show called “Leading Experts.” NBC 4 New York was unable to find any other episodes of the show. Stemper told the I-Team the video segment is a paid infomercial. A Facebook page for Spages' facility talks about diabetes at length, and says, in part, Spages offers "breakthrough diagnostic testing and analysis rarely done in the conventional setting to uncover the hidden causes of why a person maybe experiencing the diseases of diabetes and hypo-thyroidism." A sentence on the info section of the page refers to the chiropractor as Doctor Jonathan Spages, DC, which stands for doctor of chiropractic, but there's no clear indication on the landing page that's what he is and the content of the page is consumed with news and events on diabetes. His website has a disclaimer “individual results may vary. Seek medical advice from your doctor or healthcare professional." One of Spages' patients, Craig Reiman, told the I-Team Spages did help him "reverse my diabetes." He said he was under Spages' care for six months, has been off insulin and diabetes pills, lost 60 pounds and is happy with his progress. Others like Patel wonder if the "progress" was strictly a result of the stringent diet, not any revolutionary treatment philosophy. Patel noticed his blood sugar drop slightly for the first few weeks he was in treatment, but says he expected that anyone on such a strict diet would have experienced the same results. Patel thought it was unsustainable and didn’t feel the diet advice should cost thousands of dollars. "This is a wonderful, wonderful sales pitch" said Daniel Lorber, a board member with the American Diabetes Association and the Director of Endocrinology at New York Hospital. Lorber says there are no quick fixes to medical conditions like diabetes. "Chiropractors cannot treat disease and they are not allowed to represent that they treat disease so the first person a patient should go to is a physician," added Steve Lee, acting director of the New Jersey Division of Consumer Affairs, which regulates chiropractors. Both Patel and Reyes have filed complaints with the New Jersey Department of Consumer Affairs. Their cases are pending.